When Mandy, 23, learns her much-loved Grandpa is dying, she readily agrees to stay at her aunt's house to help nurse him. She used to visit her aunt regularly as a child, to play with her cousin Sarah, and often stayed overnight. Her visits were abruptly stopped 10 years before because of what her father refers to as 'the situation'. Mandy has never been told the nature of 'the situation' and it remains a taboo subject. Although the journey to her aunt's is familiar, from all her visits as a child, when Mandy arrives she finds she can't remember any of the house; her mind has completely blanked it out. Then she starts to experience strange and disturbing flashbacks - distressing images of her as a child. Mandy learns that the housekeeper was dismissed at the same time as her own visits stopped, and she becomes convinced the two are linked. Against a backdrop of nursing her dying Grandpa, Mandy starts to delve beneath the surface of her respectable family to try and find out what happened 10 years ago, and why she is being haunted by images from her past. What she discovers, the night before Grandpa's death, is so shocking that she understands why it has never been spoken of, and why it lay buried in her sub-conscious for all those years. 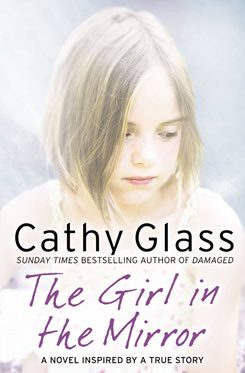 "A moving read that Cathy Glass fans will devour." " Bestselling author Cathy Glass returns with her first novel. The Girl in the Mirror is a moving and gripping story of a young woman who tries to piece together her past and uncovers a dreadful family secret that has been buried and forgotten. " " I love Cathy Glass's writing style as it's easy and flows well. This story took me on an emotional rollercoaster; there was laughter, smiles and tears. Such a good book, I just couldn't put it down. " " The twists and turns in the story are shockingly great and you'll find yourself gasping as they unravel. " " Another excellent book by Cathy Glass, once started you won't want to put it down. " " I bought it mid-afternoon and less than twenty four hours later, I'd finished. A compulsive read. Cathy sets the scene beautifully and writes compassionately and poignantly about events which I could relate. Cathy is a brilliant writer. I've read everything she has written and do hope she's going to provide more in the future. I for one can't wait! "